Intraosseous lipoma (IL) is a rare benign bone lesion, and it constitutes about 0.1% of all bone tumors. The majority of cases are located in the metaphyseal region of the long bones in the lower limbs. We report a rare case of lipoma of the ilium in a 12-year-old male child presenting with mass over the right gluteal region. Meticulous marginal dissection was done, and a pedunculated mass originating from the lower right sacroiliac region was excised in toto. 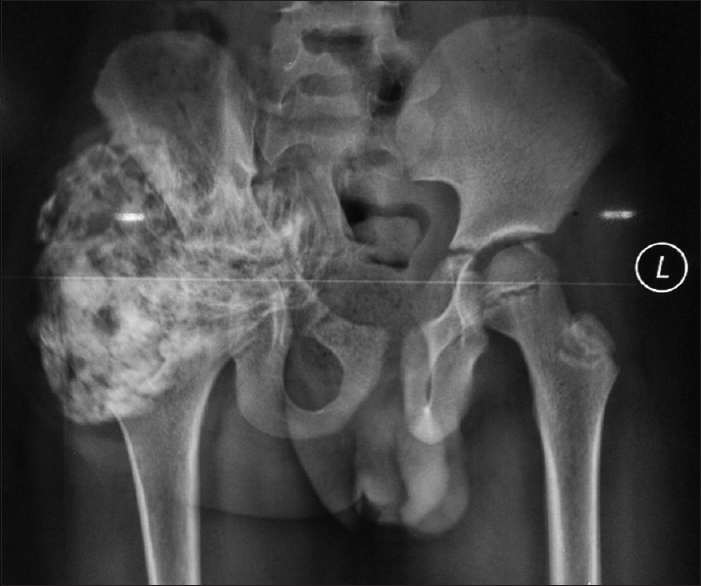 The case was an atypical example of an IL with a large outgrowth involving sacroiliac region with inconclusive magnetic resonance imaging and needle biopsy findings. Intraosseous lipoma (IL) is a rare tumor constituting about 0.1%–2.5% of all benign bone tumors. However, it is the most common lipogenic tumor of bone. Although they can be found anywhere within the skeleton, the majority of cases are located in the metaphyseal region of the long bones in the lower limbs. We report a rare case of lipoma of ilium presenting with mass over the right gluteal region. A 12-year-old male child presented with swelling over the right gluteal region for last 6 years accompanied by intermittent dull aching pain. There was no history of trauma, fever, cough, weight loss, constitutional symptoms, or involvement of any other joints. On physical examination, a firm globular swelling of size about 12 cm × 15 cm × 8 cm presents over the right sacroiliac region. It was nontender, immobile with a smooth surface and distinct edges. Clinically, terminal range of extension is restricted and rest of all movements were normal. No distal neurovascular deficit was noted. 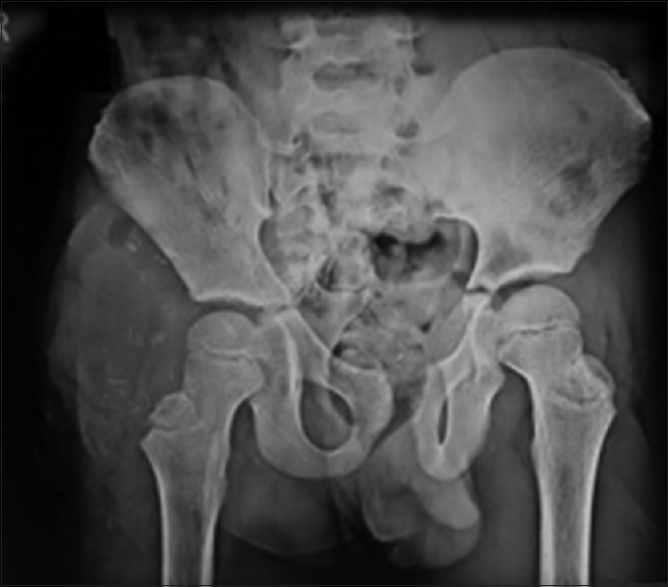 X-ray of the pelvis on anterior-posterior view revealed an irregular calcified mass, well delineated with trabeculations, extending from the right sacroiliac joint to lower half of the right ilium superiorly and sub-trochanteric region of the right proximal femur inferiorly [Figure 1]. Routine hematological tests were within normal limits. Contrast-enhanced computed tomography (CT) scan of the pelvis showed large heterogeneous mass lesion in soft tissue component of the right gluteal region with internal calcification and fatty component [Figure 2]a. Magnetic resonance imaging (MRI) of the pelvis showed a large expansile soft tissue mass involving gluteus group of muscle plane with extension to pelvic wall obliterating femoroacetabular articulation [Figure 2]b. Core needle biopsy from the lesion showed scanty fibrocollagenous stroma and small fat lobules with few striated muscle bundles, lacking any neoplastic elements. Under Kocher-Langenbeck approach, meticulous marginal dissection was done, and a pedunculated brownish-yellow encapsulated mass of about 10 cm × 8 cm × 6 cm originating from the lower right sacroiliac region was excised in toto [Figure 3]a. Histopathological study of the excised sample showed mature adipose tissue surrounding atrophic bone without atypia with irregular calcification and cyst formation indicative of IL [Figure 3]b. After surgery, X-ray of the pelvis showed no lesion left [Figure 4]. IL may present in all age groups but prevalent in the fourth and fifth decades of life with male predominant. Majority cases occur in the lower limbs (70%) with calcaneus being the most frequently involved (32%) followed by the subtrochanteric femur, the lower end of femur, the upper end of tibia, and the proximal and distal fibular shaft.,, It is less frequent in upper limb (7%) and axial skeleton (cranium: 4%; mandible: 3%; spine: 4%; and pelvis: 5%). Literature search reported only 200 cases of IL till 2011. Due to the development of diagnostic techniques, the number of reported cases has increased. However, primary from ileum is extremely rare, and the first report was made by Buckley and Burke in 1988. Majority cases are asymptomatic and diagnosed incidentally. Among symptomatic cases, pain is the most common, followed by local swelling and tenderness., The size of the lesion may vary from 10 to 120 mm with a mean of 39 mm, and larger size presentation is rare as in the present case. Lesions are usually solitary, and multiple locations have been reported. Lesions are commonly intramedullary and frequently eccentric in long bones, whereas intracortical locations are rare. Its etiology and nature is controversy yet. However, few reports showed an association of hyperlipoproteinemia, chromosomal abnormalities, and macrodystrophia lipomatosa in ILs. Increased prevalence of IL at sites with decreased trabecular bone, such as calcaneus, may suggest the theory of an overshoot of hematopoietic to fatty marrow conversion and therefore, considering as hamartomas. Some authors suggested it as a benign tumor of the medullary adipose tissue, whereas, others suggested it as a reactive change secondary to infarcts, infections, or a result of healed bony infarcts secondary to trauma. Milgram staged IL focusing on the histologic and radiological features: stage 1, tumors of viable fat cells, stage 2, a mixture of partly viable fat cells, fat necrosis, and calcifications, and stage 3, necrotic fat, a variable degree of cyst formation, and reactive woven bone formation. Gross examination of IL showed pale or bright-yellow appearance, possible lobulations with a thin capsule and septations, and are composed of mature adult fat with possible few atrophic trabeculae. Microscopic examination of IL revealed the presence of mature adipose cells, which are slightly larger than the nontumorous ones. It may include single spindle cells, regressive lesions (foci of fat necrosis, cystic spaces, and dystrophic calcifications), and bone trabeculae undergoing resorption. Mucinous degeneration, microscopic, and macroscopic cysts should be carefully observed on histopathological examination. Differentiation between lipomas and bone infarctions are difficult. However, the lack of calcifications can be highlighted in infarction. Diminution of the trabecular structures, expansion of the cortical bone, and possible presence of cysts can be found in ILs. Radiological images of IL are usually uncharacteristic. Because of the different presentational stages, radiologically, it may appear both as radiolucent lesions with a thin sclerotic border and as radiodense lesions with a thick sclerotic border. The differential diagnoses include nonossifying fibroma, fibrous dysplasia, solitary cyst, giant cell bone tumor, bone infarct, osteoblastoma, and cartilaginous tumors., In the case of a greater expansile lesion, an aneurysmal cyst should be ruled out. On imaging, IL usually presents as cystic lesions with increased radiolucency, surrounded by a sclerotic rim.,, However, a lesion at proximal femur may be surrounded by the extensive area of sclerotization. Surgery is not needed in asymptomatic cases of IL after diagnosis by CT or MRI, and few cases may undergo spontaneous involution. Surgical excision and biopsy should be done in symptomatic cases and suspected malignant potential. In the present case, excision was done due to dull aching pain. Therefore, IL poses a diagnostic dilemma on plain radiography confusing with many bone tumors. CT and MRI may be helpful in the diagnosis by elucidating intralesional fat, and unnecessary invasive procedure may be avoided in asymptomatic cases. Yazdi HR, Rasouli B, Borhani A, Noorollahi MM. Intraosseous lipoma of the femor: Image findings. J Orthop Case Rep 2014;4:35-8. Rabbani SA, Ilyas I, Alrumaih H. A rare presentation of an intraosseous lipoma in the proximal femur. Am J Case Rep 2013;14:362-5. Sen D, Satija L, Chatterji S, Majumder A, Singh M, Gupta A, et al. Vertebral intraosseous lipoma. Med J Armed Forces India 2015;71:293-6. Campbell RS, Grainger AJ, Mangham DC, Beggs I, Teh J, Davies AM, et al. Intraosseous lipoma: Report of 35 new cases and a review of the literature. Skeletal Radiol 2003;32:209-22. Palczewski P, Swiątkowski J, Gołębiowski M, Błasińska-Przerwa K. Intraosseous lipomas: A report of six cases and a review of literature. Pol J Radiol 2011;76:52-9. Buckley SL, Burkus JK. Intraosseous lipoma of the ilium. A case report. Clin Orthop Relat Res 1988;228:297-301. Eyzaguirre E, Liqiang W, Karla GM, Rajendra K, Alberto A, Gatalica Z, et al. Intraosseous lipoma. A clinical, radiologic, and pathologic study of 5 cases. Ann Diagn Pathol 2007;11:320-5. Milgram JW. Intraosseous lipomas. A clinicopathologic study of 66 cases. Clin Orthop Relat Res 1988;231:277-302. Dooms GC, Hricak H, Sollitto RA, Higgins CB. Lipomatous tumors and tumors with fatty component: MR imaging potential and comparison of MR and CT results. Radiology 1985;157:479-83. Bagatur AE, Yalcinkaya M, Dogan A, Gur S, Mumcuoglu E, Albayrak M, et al. Surgery is not always necessary in intraosseous lipoma. Orthopedics 2010;33:306.